The 4'x2' model was built by Will Jones based on the evidence produced from the many soil surveys and core samples. 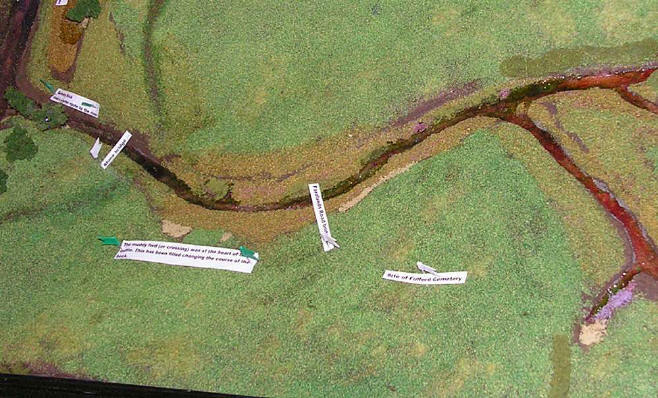 The model has been labelled to help people locate modern features as the route of the beck has been changed in the centre of the battle. This view looks to the east across the site from the far side of river Ouse. 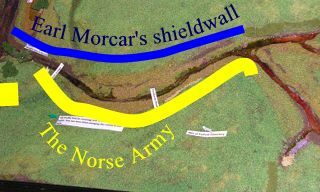 The river was tidal in 1066 and it was along the bank the king Harald led his best Norse troops to cross the beck and outflank earl Morcar's army who were 'advancing bravely' in the centre.